On Sunday, May 19, 2019, Hellenic Link–Midwest presents Professor Thanasis Zervas in a “Concert of Lyric and Romantic Songs.” The event, funded by Hellenic Foundation, Chicago, will take place at 3 pm at the Assyrian Cultural Center, 4343 W. Touhy Ave, Lincolnwood, Illinois, courtesy of the Assyrian Universal Alliance Foundation. Admission is free. On Saturday, April 6, 2019, Hellenic Link–Midwest presented Professor Robert Wallace, in a presentation on The Rise and Elite Defamation of Ancient Greek Democracy, and its Consequences for the American Republic, and Bruno Kaufmann, Director for International Cooperation at the Swiss Democracy Foundation, in a presentation on Modern Direct Democracy. The Untold Story About Switzerland And How it Became a Global Trend. The event was funded by Hellenic Foundation, Chicago. On Sunday, February 24, 2019, Hellenic Link–Midwest presented Professor Elizabeth Kosmetatou in a lecture titled: "The Poet Posidippus in the Court of Ptolemy II". On Sunday, November 11, 2018, Hellenic Link–Midwest, presented Professor Michael Cosmopoulos in a presentation titled “Myths, Monuments, and Early Greek History: Excavations at The Mycenaean Capital of Iklaina”. On Sunday, October 21, 2018, Hellenic Link–Midwest presented Professor Angeliki Tzanetou in a lecture titled: “Thinking about Gender in the Greek Theater: From Medea to Lysistrata” The event was co-sponsored by the Greek Women's University Club. On Sunday, May 20, 2018, Hellenic Link–Midwest, presented Prof. Nicholas Stephanopoulos in a presentation titled “Short-Circuiting Democracy and the Constitution”. In Celebration of the Greek Independence Day, on Sunday, March 18, 2018, Hellenic Link–Midwest, presented Yiannis Simonides in a presentation titled “Poetry and Prose of Resistance.” This event was funded by the Hellenic Foundation, Chicago. The Annual Dinner Dance, New Year Celebration, and Scholarship Awards of Hellenic Link–Midwest took place on Saturday, January 27, 2018. On Sunday, December 10, 2017, Hellenic Link–Midwest presented Professor Dan Georgakas in the Helenic Foundation lecture titled: “The Next Twenty Years in Greek America.” This lecture was funded by the Hellenic Foundation, Chicago. A transcript of the lecture is available here. On Sunday, November 19, 2017, Hellenic Link–Midwest presented Robert Wallace, Professor of Classics at Northwestern University. in a lecture titled: “Single Currencies and Economic Development in Ancient Greece: the Evidence of Coinage". On Sunday, May 21, 2017, Hellenic Link–Midwest presented Nicole Capsopoulos in a lecture titled: “The Plight of the Poor in India and the Mission of the Greek Orthodox Church in Kolkata”. On Sunday, February 26, 2017, Hellenic Link–Midwest presented Prof. Theodore G. Zervas in a lecture titled: “Growing Up in Nineteenth Century Greece: Family, Community, and the Lives of Children after Greek Independence." On Sunday, November 13, 2016, Hellenic Link–Midwest presented Dr. Thanos Catsambas, in a lecture titled: “The Greek Economic Crisis, 2010-2016: Myths, Realities, Recent Development and Prospects for the Future”. On Sunday, October 16, 2016, Hellenic Link–Midwest presented the screening of a documentary on the Sacking of Phocaea, a city of Greek inhabitants in the Ionia region of Asia Minor, in June of 1914. On Sunday, May 22, 2016, Hellenic Link–Midwest presented the Honorable Charles P. Kocoras, United States District Judge, in a lecture titled: “The Trial of Antigone”. On Thursday, April 14 2016, Hellenic Link–Midwest in cooperation with the Hellenic National Museum, the Panhellenic Scholarship Foundation, the University of Illinois at Chicago, and the Hellenic American Women’s Council presented Prof. Seiradakis in a lecture titled: “The World’s Oldest Computer: The Antikythera Mechanism”. On Sunday, February 21, 2016, Hellenic Link–Midwest presented Dr. Van Coufoudakis, Rector Emeritus at the University of Nicosia, in Cyprus, Dean Emeritus of the College of Arts and Sciences at Indiana University-Purdue University at Fort Wayne, and professor Emeritus of Political Science in a lecture titled: "The Challenge of Quality Assurance in Greek Higher Education". The Annual Dinner Dance, New Year Celebration, and Scholarship Awards of Hellenic Link–Midwest was held on Saturday, January 16, 2016. On Sunday, December 6, 2015, Hellenic Link–Midwest presented Dr. Thanasis E. Economou, in a lecture titled: “Children of Paidomazoma – Victims or Beneficiaries? A First-Hand Account”. On Sunday, November 15, 2015, Hellenic Link–Midwest presented Dr. John W. Barker, in a lecture titled: “Byzantine Humanism and the Italian Renaissance”. On Sunday, October 4, 2015, Hellenic Link–Midwest presented Dr. Angelyn Balodimas-Bartolomei, professor at North Park University (Chicago), in a lecture titled: “Promoting Social Cohesion through European Schools: The Case of Greece”. 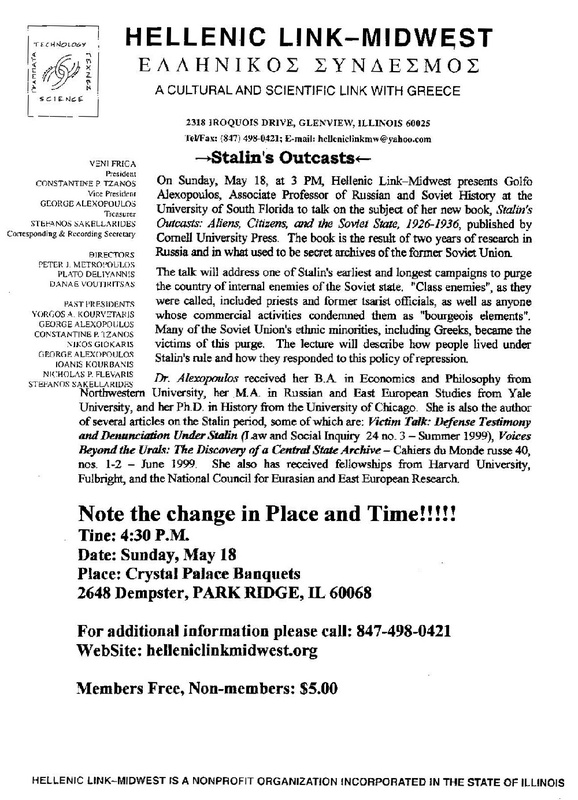 On Sunday May 17, 2015, Hellenic Link Midwest presented Savvas Koktzoglou in a lecture titled: “The Genocide of the Ottoman Greeks, 1914-1923: American Accounts Documenting the Deportations and Massacres of the Greeks of Asia Minor in 1921”. On Sunday, April 19, 2015, Hellenic Link–Midwest presented Professor Christos P. Ioannides, Director of the Center for Byzantine and Modern Greek Studies at Queens College, City University of New York, in a lecture titled: “The Dynamics of imposing the Congressional Arms Embargo on Turkey (February 1975) and its repealing by the Carter Administration (August 1978)". On Sunday, February 8, 2015, Hellenic Link–Midwest presents Professor Tom Papademetriou in a lecture titled: “A Well Kept Secret: Crypto-Christians in the Ottoman Empire”. On Saturday, January 24, 2015, the Annual Dinner Dance, New Year Celebration, and Scholarship Awards of Hellenic Link–Midwest took place. On Sunday, October 12, 2014, Hellenic Link–Midwest presented professor Ted Anton in a lecture titled “Longevity Now: The Science and Business Race for a Fountain of Youth”. On Saturday, May 31, 2014, Hellenic Link–Midwest, the Pontian Society of Chicago, and The Asia Minor and Pontos Hellenic Research Center presented Professor Andreas Gerolymatos in a lecture titled “Genocide or Massacre: the Politics of Death”. On Sunday, April 13, 2014, Hellenic Link–Midwest presented Dr. Kostas Kourtikakis in a lecture titled “European Union or Disunion? What the Greek Crisis Reveals about European Integration”. On Sunday, March 16, 2014, in celebration of the Greek Revolution of 1821, Hellenic Link–Midwest and the Hellenic American Academy presented a concert titled “Heroic Songs”: Music by Professor Athanasios Zervas, performed by: Eftihia Papageorgiou (voice), Mark Sudeith (piano), George Papadatos (percussion), Athanasios Zervas (flute and clarinet). On Sunday, February 16, 2014, Hellenic Link–Midwest presented Professor Antonis Augoustakis in a lecture titled “Greeks and Romans: Literature, Religion, and Culture”. On Saturday, January 25, 2014, the Annual Dinner Dance, New Year Celebration, and Scholarship Awards of Hellenic Link–Midwest took place. On December 8, 2013, Hellenic Link–Midwest presented Dr. Perry Hamalis in a lecture titled “Greek Philosophy as a Way a Life: Historical Shifts and Contemporary Implications”. On Sunday, November 17, 2013, Hellenic Link–Midwest presented Professor Anastasios G. Malliaris in a lecture titled “An Update on the Greek Economy”. 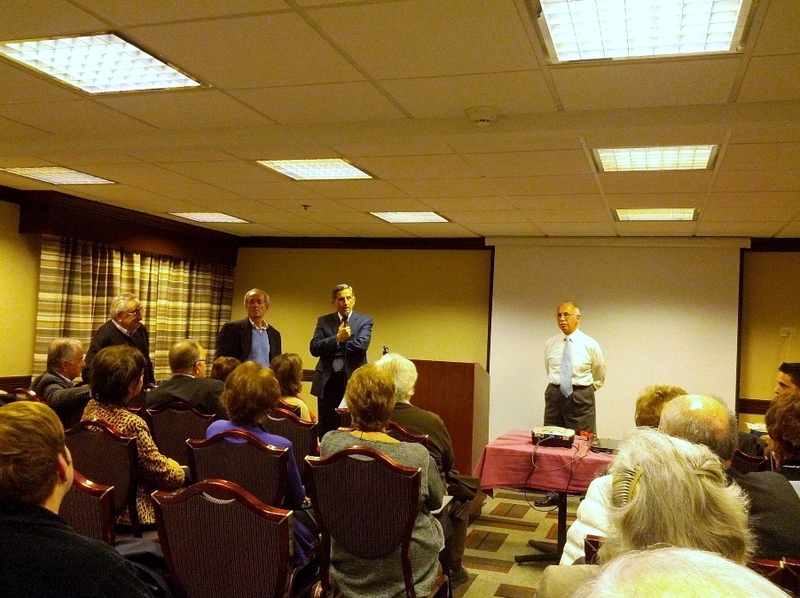 On Sunday, October 20, 2013, Hellenic Link–Midwest presented Andreas Melas in a lecture titled “Cypriot Fighters (Αγωνιστές) in the Greek Wars of the Early 20th Century”. On Sunday, May 19, 2013, Hellenic Link–Midwest presented Professor Nikos Varelas in a lecture titled “Why we Should be Excited by the Higgs Discovery”. On Sunday, April 14, 2013, Hellenic Link–Midwest presented Professor Marina Terkourafi in a lecture titled “Toward a Social History of Language in Cyprus”. On Sunday, March 17, 2013, in celebration of the Greek Independence Day, Hellenic Link–Midwest presented Dean Kostantaras in a lecture titled “Konstantinos Paparrigopoulos: the First Great ‘National Historian’of Greece”. On Sunday, February 24, 2013, Hellenic Link–Midwest presented Professor Jennifer Hockenbery in a lecture titled “What does Athens have to do with America? : Recovering hope in community dialogue”. On Saturday, January 19, 2013, the Annual Dinner Dance, New Year Celebration, and Scholarship Awards of Hellenic Link–Midwest took place. 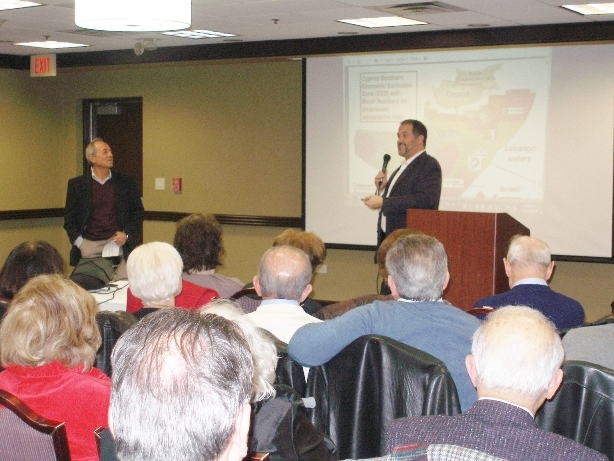 On Sunday, December 9, 2012, Hellenic Link–Midwest presented Professors George M. Constantinides and Anastasios G. Malliaris in a lecture titled “Recent Economic Developments in Greece”. On Sunday, November 18, 2012, Hellenic Link–Midwest presented professor Antony Avgoustakis, in a lecture titled “Women in the Ancient World, Athens and Rome”. On Sunday, October 28 2012, Hellenic Link–Midwest presented Dr. Blytas, in a lecture titled “The First Victory, Greece in the Second World War”. On Sunday, May 6 2012, Hellenic Link–Midwest presented Anastasia Giannakidou, Professor of Linguistics at the University of Chicago, in a lecture titled “Truth, (Non)veridicality, and the Grammar of Greek”. On Sunday, Aprl 22, 2012, Hellenic Link–Midwest presented Professor Emeritus Victor Papacosma, in a lecture titled “Greece in The 1930s:Prelude to New Crises. On Sunday March 18, 2012, Hellenic Link–Midwest presented, in celebration of the Greek Independence Day, Dr. Dean Kostantaras in a lecture titled “Greek Elites of the Peloponnese and the Revolution of 1821". On Sunday, February 26, 2012, Hellenic Link–Midwest presented professor Theodore C. Kariotis, in a lecture titled “The Greek-Turkish Dispute in the Aegean Sea and the role of the Exclusive Economic Zone”. On Saturday, January 21, 2012 the Annual Dinner Dance, New Year Celebration, and Scholarship Awards of Hellenic Link–Midwest was held. On Sunday, December 11, 2011, Hellenic Link–Midwest presented economics professor Costas Azariadis, Washington University in St. Louis, in a lecture titled “Greece Without Reform”. On Sunday, October 23, 2011, Hellenic Link–Midwest presented journalist David Binder, correspondent for The New York Times between 1961-2004, in a lecture titled “Greece, Turkey and NATO”. On Sunday, May 22, 2011, Hellenic Link–Midwest presented Dr. Constantine Tzanos in a lecture titled “What Happened at the Fukushima Nuclear Power Station and Lessons to be Learned”. On Sunday, 10 April, 2011, Hellenic Link–Midwest presented Anthony Kaldellis, Professor of Greek and Latin of the Ohio State University, in a lecture titled “Hellenism and Byzantium”. On Sunday, March 20, in celebration of the Greek Independence Day, Hellenic Link–Midwest presented music composer and conductor Dr. Athanasios Zervas, University of Macedonia, Department of Music Science and Art, Thessaloniki Greece, in a lecture titled “Heroes, Heroism, and Heroic Songs of the 1821 Independence through the works of Greek Symphonists”, followed by a concert of "Songs about the Heroic Sacrifice and the Celebration of Greek Independence of 1821", based on the poetry of Rigas Fereos, Andreas Kalvos, Kostas Krystalis, Dionisios Solomos, Spiridon Trikoupis, Aristoleles Valaoritis, Georgios Vizyionos. set to music by A. Zervas and performed by a group consisting of D. Pleasant (soprano), J. Raynovich (violoncello), M. Smith (percussion), and M. Sudeith (piano). On Sunday, February 27, 2011, Hellenic Link–Midwest presented Ambassador (ret.) Robert V. Keeley, in a lecture titled "The American Embassy and the Collapse of Democracy in Greece, 1966–1969". On Saturday, January 22, 2011 the Annual Dinner Dance, New Year Celebration, and Scholarship Awards of Hellenic Link–Midwest was held. On Sunday, December 12 2010, Hellenic Link–Midwest presented Kent Rigsby, Professor Emeritus of Epigraphy and Ancient History at Duke University, in a lecture titled "Censorship and the law in ancient Athens". On Sunday, November 21 2010, Hellenic Link–Midwest presented Professor Nanno Marinatos from the Department of Classics and Mediteranean Studies at the University of Illinois at Chicago, in a lecture titled “Greek Elysium and Egyptian Ideas at about 663 BC”. On Sunday, October 17, 2010, Hellenic Link–Midwest presented Dr. Andrew Horton, professor of Film and Video Studies at the University of Oklahoma, in a lecture titled “I WAS BORN GREEK! : The Life, Times, Films and Influence of Melina Mercouri (1920-1994)"
On Sunday, May 23, 2010, Hellenic Link–Midwest presented professor Marinos Pourgouris of Brown University, in a lecture titled “Greece and the Mediterranean: Cultural Geography and National Identity”. On Sunday, April 18, 2010, Link–Midwest presented musical group "Balkanalia" at the great hall of St. John the Baptist Greek Orthodox Church in Des Plaines, 2350 East Dempster Street. Balkanalia, the University of Illinois Balkan Music Ensemble, presented songs and dance tunes from Greece, Turkey, Bulgaria, Armenia, Bosnia, Croatia, and Serbia. On Sunday, March 21, 2010, in celebration of the Greek Independence Day, Hellenic Link–Midwest presented, in cosponsorship with the National Hellenic Museum, Professor Menelaos Christopoulos in a lecture titled “The Greek Revolution of 1821: What made a Philhellene?". On Sunday, February 21 2010, Hellenic Link–Midwest presented Professor Frank Hess of Indiana University, in a lecture titled “Reimagining Φιλοξενία: The Nation-State, Immigration, and the Politics of Hospitality”. The Annual Dinner Dance, New Year Celebration, and Scholarship Awards of Hellenic Link–Midwest was held on Saturday, January 23, 2010, at the Four Point Sheraton Hotel, 10249 West Irving Road at Schiller Park. On Sunday, December 13, 2009, Hellenic Link–Midwest presented Artemis S. Leontis, associate Professor of Modern Greek at the University of Michigan, in a lecture titled “Greek Theatre in Modern Dance: an Alternative Archaeology”. On Sunday, October 18, 2009, Hellenic Link–Midwest presented Jonathan Hall, head of the Classics Department at the University of Chicago, in a lecture titled “The Myth of Equality and Citizen Militias in Archaic Greece”. On Sunday, May 17, 2009, Hellenic Link–Midwest presented Prof. George Karras and Dr. Peter Evangelou in a lecture titled " The Financial Meltdown of 2008". On Sunday, April 26, 2009, Hellenic Link–Midwest presented Prof. Allan Kershaw in a lecture titled "The Muse Named Homer". On Sunday March 29, 2009, in celebration of the Greek Independence Day, Hellenic Link–Midwest presented acclaimed theatrical performer/writer/producer Yannis Simonides, in a reading/performance titled “Women of the Revolution". On Sunday February 22, 2009, Hellenic Link–Midwest presented Prof. Michael Seng (professor of law at The John Marshall Law School in Chicago) in a lecture titled "The Contribution Of Classical Greece To The United States Constitution". On Saturday, January 17 2009, The Annual Dinner Dance, New Year Celebration, and Scholarship Awards of Hellenic Link-Midwest was held at the Four Points Sheraton Hotel, 10255 West Irving Park Road in Schiller Park, Illinois. On Sunday December 14, 2008, Hellenic Link–Midwest presented Dr. Nicholas Askounes Ashford, Professor of Technology and Policy Director, Technology & Law Program Massachusetts Institute of Technology, in a lecture titled "Sustainable Development in the Globalized 21st Century: Challenges for the Economy, Environment, and Employment". On Sunday November 16, 2008, Hellenic Link-Midwest presented Peter Bien, Professor of English and Comparative Literature, Emeritus, at Dartmouth College, in a lecture titled "The Philosophical Basis Of Kazantzakis’ Writings". On Monday November 10, 2008, Hellenic Link–Midwest cosponsored a conference on "Revelation in Ancient Greek Religion" organized by the Department of Classics and Mediterranean Studies of the University of Illinois, at the UIC Institute for the Humanities, 701 South Morgan, Lower Level, Stevenson Hall, Chicago, IL. The speakers include Oxford professor of Greek History Robert Parker, Harvard professor of Greek Literature Albert Henrics, State University of New York, Buffalo professor of Classics Roger Woodward. On Sunday October 26, 2008, Hellenic Link–Midwest presented Dr. Nikolaos Stavrou, Graduate Professor of International Affairs and Political Science, Emeritus, at Howard University, in a lecture titled "The Post-Cold War Balkans: Experimenting With Neo-Ottomanism". On Sunday May 18, 2008, Hellenic Link-Midwest presented Eve Geroulis, Professor at Loyola University's School of Business, in a lecture titled "Modern Media Agora: The Intersection of Democracy and Demos". On Sunday April 13, 2008, Hellenic Link-Midwest presented Dr. John Wynne, Assistant Professor of Classics at Northwestern University, in a lecture titled "The Thought of the Stoic Philosophers". The Stoics (named after the Stoa Poikile in Athens, where they traditionally met) formed a school of philosophy and science that had colossal influence both for the ancient Mediterranean world and in the evolution of modern thought. The lecture sketched the history of the Stoics school, and aim to understand some of its more distinctive and fruitful claims about the world. In celebration of Greek Independence Day, on Sunday, March 16, 2008, Hellenic Link-Midwest presented Professor Nanno Marinatos in a presentation titled, "The Poet of Freedom". Professor Marinatosl read from the Hymn to Freedom, the Free Besieged, and Psara, all renowned poems of the Greek National Poet Dionysios Solomos, and she will comment on the poet's perceptions of the struggle of the Greeks for freedom and his vision of a free Greece. To fully capture the spirit of this struggle, this reading will be supplemented with readings from the work of the Turkish Historian Taner Akçam's A Shameful Act, the Memoirs of the heroes of the Greek Revolution General Makriyiannis and General Theodoros Kolokotronis, and the work of the poet Aristotelis Valaoritis. On Sunday, February 24, 2008, Hellenic Link Midwest presented Dr. Andrew Horton, Professor of Film and Video Studies at the University of Oklahoma, in a lecture titled "The Greek and Balkan Spirit of Comedy in the Cinema of Theo Angelopoulos". Adjunct Professor of Physics, Texas Tech University in a lecture titled, "The World of Elementary Particles". On Sunday November 4, 2007, Hellenic LinkMidwest presented Yannis Simonides, in a reading/performance titled CAVAFY, Passions and Ancient Days ". On Sunday, October 21, 2007, Hellenic Link-Midwest presented Dr. George C. Papavizas, noted author, in a lecture titled, "Macedonia: The Struggle for the Heritage, Territory, and Name of the Historic Hellenic Land, 1862-2004." an instrument for Ethnic Cleansing of Anatolia 1913-1922". On Sunday, April 22, 2007, Hellenic Link-Midwest presented Professor Andre Gerolymatos, in a lecture titled "The British Intelligence Services and the Roots of the Greek Civil War". On Sunday, March 18, 2007, in Celebration of Greek Independence Day, Hellenic Link-Midwest presentedJames Stoyanoff and the Orpheus Hellenic Folklore Society in a program entitled "Music and Dance Inspired by the Struggle for Freedom"
at the Greek Orthodox Church of Saint John the Baptist, 2350 East Dempster, Des Plaines, Illinois. On Sunday, March 11, 2007, the young professionals of Hellenic Link-Midwest organized a Night of Rebetika by Rebetoneira (Dreams of the Rebet) at Parthenon Restaurant in Chicago. On Sunday, February 4, 2007, Hellenic Link-Midwest presented Vassilis Lambropoulos, Professor of Modern Greek at the University of Michigan, in a lecture titled "Greek American Accents". On Sunday December 10, 2006, Hellenic Link-Midwest presented Paul J. Griffiths, Schmitt Chair of Catholic Studies, University of Illinois at Chicago, in a lecture titled: "Greek Thought and Western Christianity". On Sunday October 22, 2006 Hellenic Link-Midwest presented Author Beatriz Badikian-Gartler, in a reading from her book titled "Old Gloves - A 20th Century Saga". On Sunday June 4, 2006 Hellenic Link-Midwest presented Dr. Thanasis Economou, in a lecture titled "Exploring Mars, Saturn and comets and having fun doing it." On Sunday April 9, 2006 Hellenic Link-Midwest presented Dr. Constantine Tzanos, in a lecture titled "Is the Age of Oil Approaching its End?" at the Greek Orthodox Church of Saint John the Baptist in Des Plaines, Illinois. On Sunday February 26, 2006, Hellenic Link-Midwest presented Professor Gonda Van Steen, in a lecture titled "Venom in Verse: Aristophanes in Modern Greece. On Sunday December 18, 2005, Hellenic Link-Midwest presented Jim Logothetis, Senior Partner with Ernst & Young LLP, in a lecture titled: "Succeeding as a Professional-A Case Study in Public Accounting Profession". On Sunday, October 16, 2005, Hellenic Link-Midwest presented Plato's "The Apology of Socrates," a performance by Yannis Simonides, at Saint John the Baptist in Des Plaines, Illinois. On Sunday, April, 24, 2005 Hellenic Link�Midwest presented Dr. Spero Kinnas in a lecture titled �Societal challenges and ccomplishments for Orthodox Missionaries in the field�. On Sunday, March 20, 2005, Hellenic Link-Midwest presented Yannis Simonides in celebration of the Greek Independence Day. Mr. Simonides performed excerpts from poems and songs that helped inspired the Greek War of Independence. On Sunday, February 20, 2005, Hellenic Link-Midwest presented "Soul Murder and Tragic Art", a Lecture-Performance, by Professor Antonia Cacouros, University of California, Sacramento. On Sunday, December 12, 2004, Hellenic Link-Midwest presented Mr. Peter Parthenis in a lecture titled: "Going into Business for Yourself vs. Working for a Company� One Man�s Right Choice�. One Sunday, November 21, 2004, Hellenic Link-Midwest presented Professor Leonidas Pittos in a lecture titled: "Byzantium in the History of Modern Greece: Perceptions of Continuity and Change". On Sunday, October 24, 2004, Hellenic Link-Midwest presented Professor Nanno Marinatos, in a lecture titled "Paradise in the East Mediterranean: A Vocabulary of Narrative and Visual Motifs"
On Sunday, May 23, 2004, Hellenic Link-Midwest presented Professor Irini Vallera-Rickerson in a lecture titled "Athletries: The Untold History of Ancient Greek Women Athletes". On Sunday, April 18, 2004, Hellenic Link-Midwest presented "Opera and the Ancient World: Aida & the Rosetta Stone, the Parthenon, and Empire", a lecture by Jon Solomon, Professor of Classics at the University of Arizona. On Sunday, March 21, 2004, Hellenic Link-Midwest presented Maria Foustalieraki in a program titled "Highlights from the Greek history - poems and songs from the struggles for freedom". A poetry reading by Professor George Economou. A lecture by UIC's Professor Pietro Bortone, Ph. D.
Professor Nanno Marinatos, Ph. D.
on Sunday, October 26 2003. A talk by Ms. Golfo Alexopoulos, Ph. D.
on Sunday, May 18, 2003. "Greek Daily Life in the 16th Century Ottoman Empire"
Saturday, March 29, 2003, at 7 p.m.
that keeps alive and thriving our bonds with our Hellenic heritage. On Sunday, February 16, 2003, Hellenic Link–Midwest presented John Sitilides, Executive Director of the Western Policy Center, in a lecture titled: The Dominance of Geopolitics in the Eastern Mediterranean. University of Illinois at Chicago (UIC). December 8, 2002, Dr. Peter Diamandis in a lecture titled "Opening the Space Frontier". November 10, 2002, Professor Christoph Riedweg in a lecture on Pythagoras, the Pythagoreans and After Life Beliefs. October 13, 2002,, Hellenic Link –Midwest and Concertante Di Chicago presented a tribute to the celebrated Greek Composer Mikis Thedorakis at DePaul University Concert Hall, 800 West Belden Street, in Chicago. The program includes: Adagio, Concerto for Piano and Orchestra, Theodora Satolia, piano, Actas de Marusia, and Syrtaki from Zorba. February 24, 2002, John Sitilides, Executive Director of the Western Policy Center, in a lecture titled: EU-Turkish Relations: The Prospects for Greece and Cyprus. December 2, 2001, professor Diane Touliatos in a lecture on Medieval Byzantine Music: Its Heritage and Cultural Influences. April 22, 2001, distinguished professor of history Speros Vryonis, Jr., in a lecture on "Images of the Greeks from the Time of the Enlightment and Turkish Propaganda". March 18, 2001, in celebration of the Greek Independence day, Theater Nefeli in the play The Solemn Vow (Η Ιερή Υπόσχεση); The celebration closed with Greek dances by the Orpheus Dance Troupe. February 25, 2001, Phillip Spyropoulos in a lecture on "Bias in the Media; Is the Media Covering Hellenic Issues Fairly and Accurately? December 10, 2000, Dr. Panos Evangelou in a lecture on "The Contribution of the Greek Economy to the Development of the Balkans". On Sunday October 29, 2000, Hellenic Link - Midwest presents Professor Alexandros K. Kyrou in a lecture on "The Greek-American Response to Famine in Axis-Occupied Greece". November 19, 2000, a recital of Greek Love Songs; at the Irish American Heritage Center, 4626 North Knox Avenue in Chicago. Voula Karahaliou and Theodora Satolia presented love songs of Manos Hatzidakis, Mikis Theodorakis, Loizos, Hatzinasios and other prominent Greek composers. The distinguished pianist Theodora Satolia also performed the work of Manos Hatzidakis "Six Popular Paintings" (“Exi Laikes Zografies”). April 16, 2000, a lecture on Towards an Architecture of Space - A Journey Through the Architecture of the Greek World by Anita Skarpathiotis. December 12, 1999, A Show of Original Paintings Inspired by the Glory of Greece, the work of Tassos Ganitopoulos. October 3, 1999, the Honorable Jim Karygiannis, Member of the Canadian Parliament, in a lecture on the Turkish Adventurism with Nuclear Power. The lecture was held after Sunday Mass at the Hall of the St. Demetrios Greek Orthodox Church, 2727 West Winona Street, Chicago, Illinois. October 2, 1999, Canadian MP Jim Karygiannis, Ara Sarafian and Hilmar Kaiser in a lecture on Turkish Nationalism - The Pontian and Armenian Genocides. held at 4:00 PM, at the Cretan House, 5941 Milwaukee Avenue, Chicago, Illinois. October 24, 1999, Professor Nicholas Stavrou, in a lecture on “Balkans in Our Times: Recurring Patterns of History”. March 21, 1999, in celebration of the Greek Independence Day at the Greek Orthodox Church of Saint John in Desplaines, Illinois. theatrical play "Η Ρωμιοσύνη θα χαθεί όταν o Κόσμος Σβύσει" (Hellenism will Set Only when the World Ends) by the Theater "Nefeli" of The Greek Community of Metropolitan Toronto - stage adaptation by Nancy Athanassopoulou-Mylonas; and Greek dances by the Orpheus Dance Troupe of the Macedonian Society. Lecture by Dr. Stelios Ramfos. December 7, 1997, the Very Reverent Dr. Demetrios J. Constantelos in a lecture on Prodromes to the Interrelationship (Alleloperichoresis) Between Christian Orthodoxy and Hellenism. October 19, 1997, a at Crown Center Auditorium of Loyola University, Greek Women's University Club, the Hellenic Club of Loyola, KRIKOS Midwest, and the Hellenic Professional Society of Illinois presented Greek-American Women in Politics, a panel discussion with the Honorable Adeline Geo-Karis, Senator, Commissioner Maria Pappas, and Stella Adams Cuthbert. April 20, 1997 Professor Gregory Jusdanis, Ohio State University, in a lecture on Global Hellenism. 3/30/1997: Greek Independence Day Celebration with a performance by Toronto Theater Group "Nefeli" presenting the "Poet of Freedom, Dionysis Solomos". 5/19/1996: "Nostalgia and the Greek Immigrational Experience", Lecture by Dr. Michael Dunkas, MD. 3/24/1996: Greek Independence Day Celebration with a celebration speech by Dr. Artemis Leontis titled "Diaspora Greeks and the Cause of Greek Independence", music by Maria Foustalieraki, and Greek dances by the Orpheus Dance Troupe o the Macedonian Society. 3/5/1995: "Mr. Greedy", a hilarious comedy by Demetre Psathas presented by the St. John Players. 2/19/1995; "Is American Policy Anti-Greek?" 4/10/1994: "The Events of the Balkans through the Eyes of the Press", Lecture by James O' Shea. 3/27/1994: Celebration of the Greek Independence Day, in cooperation with HPSI, Greek-American Community Services, and Enosis, with main speaker Dr. Theofanis Stavrou ina lecture tiled: "The Preservation of Hellenism during the Dark Ages of the Ottoman Empire" . Also Leonidas Marinakos made a narrated slide presentation titled "170 Years from the Holocaust of Psara". 2/27/1994: "Greek Primay Education in America: Entering the 21st Century": a small symposium with panel presentations by Pantelis Vasdekis (president of the Greek Teachers Association "the Three Ierarchs"), Fotis Litsas, Superidentent, Greek Parochial Schools of the Arhdiocese, and Maria Hatzinakou-Litsa, Councelor of Educational Affairs. Also every year in January, Hellenic LinkMidwest has held its New Year Celebration, Annual Dinner Dance, and Scholarship Awards. The proceeds provided for the scholarships and the association's cultural and educational programs.